Initially bred as a gundog, the Poodle has now found itself as the dog of choice for those seeking to inject a little glamour into their life. A Poodle is usually recognisable by the elegant cut of their coat, making them something of an aristocrat amongst dogs. They are graceful in movement and highly intelligent dogs. While the Standard Poodle of the show ring might look more like a supermodel, he is a working dog at heart. Originally from Germany, Poodles were bred to retrieve from the water, and, being both active and clever, they still thrive with a job to do. While people may laugh at some of the more flamboyant Poodle hairdos, historically they have a very good purpose. Poodles were originally used to retrieve birds from lakes and rivers, and had their coat been left at full length, it would have become too heavy for them to stay afloat, so, as much was cut off as possible, while leaving unclipped patches over the dogs’ joints and internal organs to keep them protected from injury and cold. The Poodle is exceptionally obedient and keen to learn, their intelligence means they pick up even difficult tasks with relative ease. They are wonderful with children and love being involved with the family, although they don't enjoy too much rough and tumble. 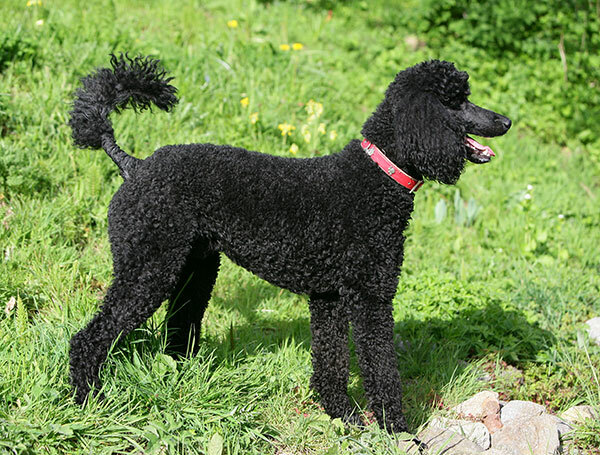 According to the Breed Standard, a Standard Poodle should measure over 38cm. Beyond regular grooming and paying close attention to the areas around the eyes and ears little special care is required for this breed.